Death Valley was declared a National Monument by President Hoover in 1933 and was expanded to more than 5000 square miles with National Park status in 1994. It is the largest of the National Parks in the US. As we learned on the road, the deadly name was given in earnest in 1850 along with a story of survival, for some but not all. There are two major road entrances into Death Valley National Park, one from Nevada and one from California. Looking for desert grandeur, we chose Hwy-58 through Bakersfield and the Tehatchape Pass (3771 ft.) into Mojave; and then north on Hwy-14, -178 and -190. 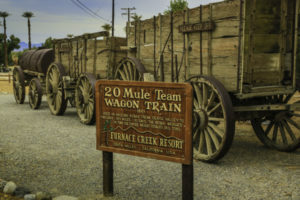 Passing through Mojave, (now a parking ground for retired jet airliners), we learned that in the 1850s it was the destination for gold and silver mined in the Panamint mountains west of Death Valley. In 1890s it was the southern rail terminus for borax mined in Death Valley and destined for laundry detergents like Boraxo. The dry white cargo was hauled 165 gritty miles down Death Valley by twenty-mule teams hitched to borax wagons – a real testament to man’s (and mule’s) tenacity in that harsh environment. Today the roads don’t follow the old wagon train route and with hybrid horse power instead of mules, for us the trek was faster and far less dangerous. 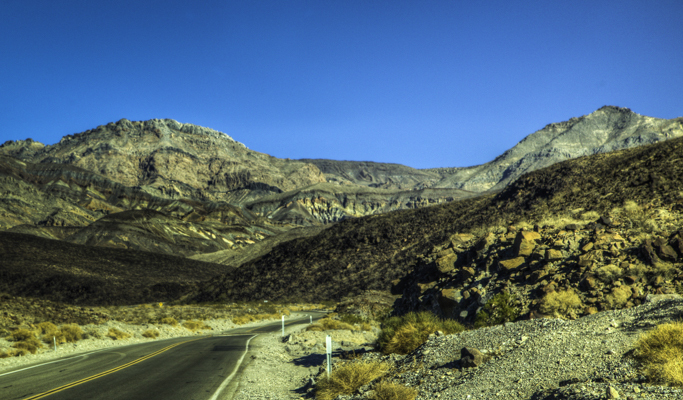 To the north of Mojave lay Red Rock Canyon, on our circuitous route to an overnight stay in Ridgecrest. We’d been told not to miss the canyon, and were very glad we didn’t. Red Rock Canyon State Park was our first introduction to the grandeur that awaited us in the interior deserts of California. Reminiscent of Bryce Canyon in Utah, the desert cliffs, buttes and red-orange rock formations are on a scale that is more intimate. The beauty of nature and quiet solitude of the desert reached out and immediately grabbed our psyche. We’re both thinking out loud – ‘we made the right decision with this trip’. After an overnight stay in Ridgecrest, we were back on Hwy-178. In December the road is very quiet and, other than waving to a low flying Navy jet that buzzed us, we saw little evidence of any human kind, or other four legged kind for that matter. Viewing the vast open expanse of high desert on a road that stretched to the horizon without a vehicle on it was a wonderful awe inspiring experience. Along the way I was reminded of the scene in the movie “Wild” where Cheryl Strayed (played by Reese Witherspoon) is dropped off in the desert and starts her long hike up the Pacific Coast Trail. That trail crosses Hwy 178 near Walker Pass (elevation 5246) which is near Ridgecrest. In the movie the strenuous dusty two-foot wide trail was life changing for Cheryl Strayed. As we drove I noticed many dusty lonely little trails leading off into the desert. I can’t help asking myself whether each might lead to a different life changing experience. Lost in this desert could definitely be a life-ending experience, as it was for some of the Brier Party involved in the survival story that unfolded for us down the road in the Panamint Valley. The vastness of the vistas and stillness of the desert provided me with a strong sense of peace, tranquility, reflection and meditation – – the desert definitely was working on me!……….ooommmmmmm. 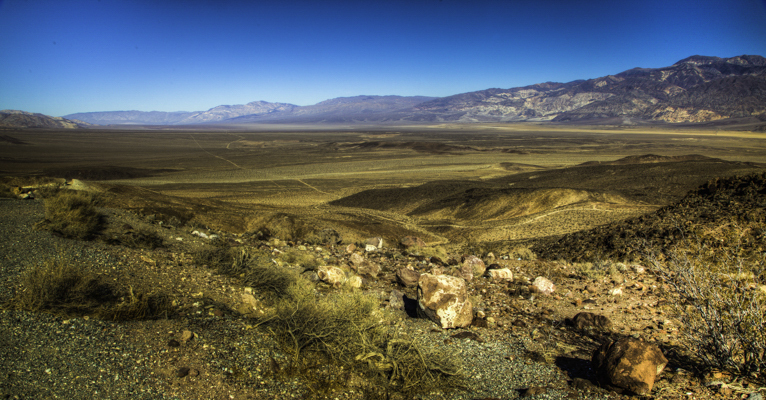 Viewing the Panamint Valley from the mountain pass I was first struck by the silence; then the empty vast expanse; then the lonely little road running off in a straight line to the horizon without a single vehicle. After a momentary pause, I realized that was our road; next, no gas, no rest stops, no water, no buildings, no one as far as the eye could see. Behind us, it was many miles to help. This was definitely not a good place to get stuck in loose sand. 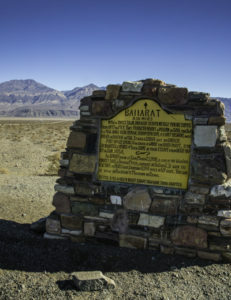 In a few miles on into the valley we came to a historical marker for “Ballarat” erected by the “Death Valley Escape Trail Conference.” We were left to wonder, what escape trail? We pieced together an answer from historic markers. As for “Ballarat”, we found it was a ghost town 3.5 miles into the desert on a sandy dirt road. For a fleeting moment I thought it might be interesting to visit, but then I remembered how dangerous it could be to get stuck in the desert and decided – maybe next time in a 4X4 rather than a Prius. For twenty years (1897-1917,) Ballarat was a thriving gold mining town. While the gold lasted the town boasted a Wells Fargo office, school, jail, morgue, three hotels and seven saloons. When the gold ran out in 1917 so did the town, but “Slim”, the last and only inhabitant, wasn’t laid to rest in Boothill until 1968. Given the solitude of the desert and the ghostly town, he must have had an interesting take on life. Photographing the long empty road, thinking about Slim and listening to the utter silence, I just had to think – what was his life about anyway; way out here alone; a lonely existence, but perhaps instead a highly meditative existence with a very quiet monkey-brain? Maybe that herd of wild burros in the distance would know. The desert definitely worked on me. The complete beauty of the landscape wasn’t disturbed by a breath of air, not even a bird or an insect – it was its naked, natural raw self….oooommmmmm. Investigating online, the gold miners included men and women from Kansas who set out from Utah hoping for a shorter route to the California gold rush. 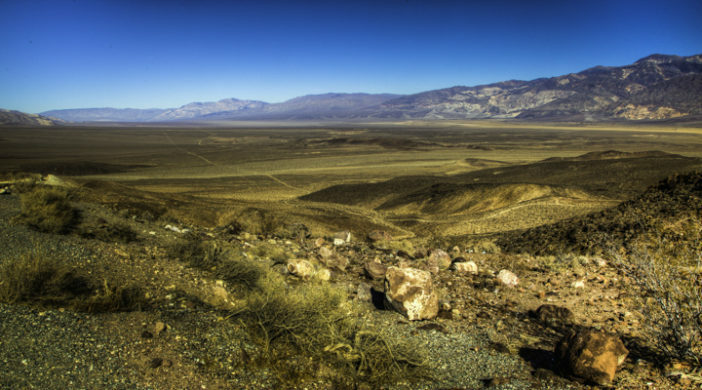 After five weeks of thirst and near starvation, with only one death, they succeeded in crossing Death Valley to find water in the Panamint mountains. As they left the place where they all had come so close to death, one woman was supposedly heard saying “Goodbye Death Valley.” Apparently that name stuck. Given the emptiness of the desert in December, I was very glad we didn’t get stuck. Gas stations are nearly non-existent, (Ridgecrest, Stovepipe Wells, Furnace Springs), so double-check your gas gauge before you go. Also check your water supply. 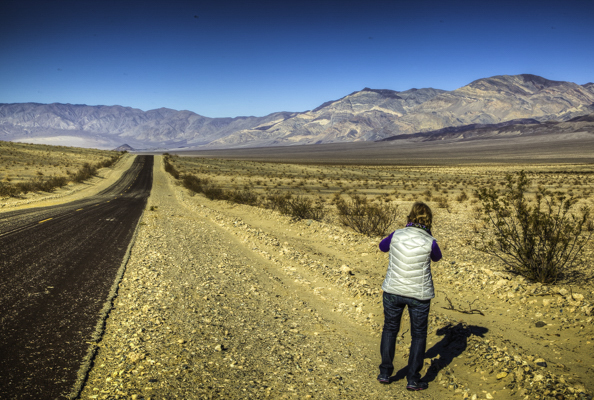 There are no convenience stores, restaurants or bathrooms in the Panamint Valley on the route into Death Valley. 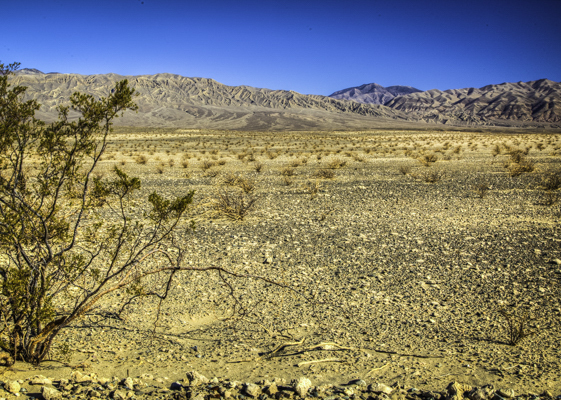 In Death Valley National Park lodging and camping is limited, but available at Furnace Creek. Before you go, double-check vacancy at the Inn at Death Valley, The Ranch at Death Valley or Fiddlers Campground. Formerly “The Inn at Furnace Creek”, with a recent major renovation the Inn changed its name to “The Inn at Death Valley“.